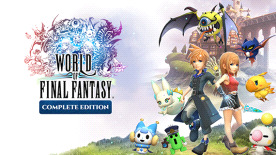 Experience the full WORLD OF FINAL FANTASY adventure with the WORLD OF FINAL FANTASY COMPLETE EDITION. © 2016, 2018 SQUARE ENIX CO., LTD. All Rights Reserved. CHARACTER DESIGN: TETSUYA NOMURA/YASUHISA IZUMISAWA. LOGO ILLUSTRATION: © 2016 YOSHITAKA AMANO. WORLD OF FINAL FANTASY, SQUARE ENIX and the SQUARE ENIX logo are registered trademarks or trademarks of Square Enix Holdings Co., Ltd.